Funeral services for Robert William Hopper, 91, Canby, MN, and formerly Aberdeen, SD, are 2:00pm, Friday, February 1, 2019, at Spitzer-Miller Funeral Home, 1111 S. Main St., Aberdeen, with Pastor Gary Wileman officiating. Burial: Riverside Memorial Park, Aberdeen. 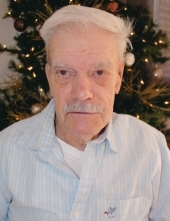 Robert died Monday, January 28, at Sanford Canby Medical Center. Visitation: 3:00-7:00pm, Thursday, with family present from 5:00-7:00pm, at the funeral home. Robert William Hopper was born on February 9, 1927 in Sioux Falls, SD. He was adopted at the age of two by Thomas and Victoria (Hunter) Hopper. He grew up on a farm near Roscoe, SD. Robert married Florayne Leicht in September of 1950. They farmed for a few years before making their home in Aberdeen. Robert held various jobs including working for the Aberdeen Fire Department, doing custodial work, and working for Burke Monument for several years. In 1970, their family relocated to Minneapolis, but returned to Aberdeen in 1975. Robert worked for many years at his company, Hopper Carpentry and Painting. Florayne died in 1985. Robert married Laura Basco in January of 1989, in Ipswich, SD. They continued to make Aberdeen their home. Laura died in 1999. Robert moved to Canby, MN in 2015. Robert was a loving father who cared that his children knew what was important. The legacy he left to his family included having a sense of identity, learning from your failures as well as your triumphs, knowing Biblical history and knowing history is His (God’s) story. Grateful for having shared Robert’s life are his children: LeRoy (Sandie) Hopper, Darlene (Les) Loebs, Dorothy Young, David (Susan) Hopper, Tim (Brenda) Hopper, Tommie Hopper, Lee (Sara) Basco, Susan (Lee) Howell, Abe (Lisa) Basco, Hannah (Tyler) Jessen; grandchildren: Rebekkah (Jim) Shrimplin, Benjamin (Kristina) Hopper, Aaron (Bethany) Hopper, Tammy Kvasnicka, Traci Perez, Jodi (Zach) Altheide, Michael Hopper, Sarah Hopper, Lisa Hopper, Anthony Howell, Rebecca Howell, Angela Howell, Huxley Basco, Porter Van Basco, Laura Jessen, Megan Jessen; and sixteen great-grandchildren. Preceding Robert in death are his first wife, Florayne Hopper, second wife, Laura Hopper, grandson, Jeremy Young, his parents, Thomas and Victoria, and siblings, Shirley Jochim and Odean Permann. To send flowers or a remembrance gift to the family of Robert William Hopper, please visit our Tribute Store. Family will be present from 5:00-7:00PM. "Email Address" would like to share the life celebration of Robert William Hopper. Click on the "link" to go to share a favorite memory or leave a condolence message for the family.